Malta is a beautiful nation made from a chain of islands that rest in the middle of the Mediterranean Sea. It is known for its delicious food, ancient tourist sites, and as the namesake of one of the oldest breeds in the world: the Maltese dog. The oldest record of this small, white toy dog was the decoration on a large Grecian pottery jar called an amorpha, dated at 500 BC. In 370 BC, Aristotle mentioned this breed in his writing, comparing it to a ferret or weasel. The Greeks even built tombs to house their beloved Maltese dogs. Throughout history, countless breeders and families have owned a Maltese, shaping and creating the breed to what it is today. 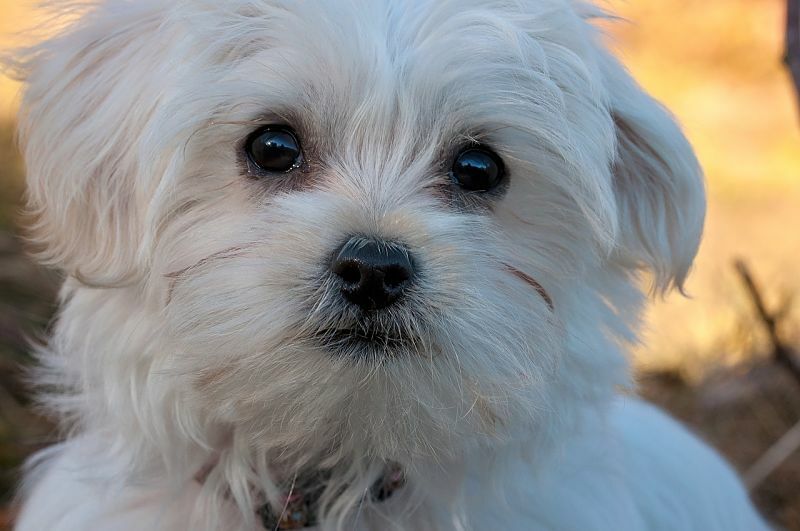 The Maltese is a small dog with white fur. It weighs from four to seven pounds and stands eight to ten inches tall at the shoulder. The silky white fur that covers its body, paired with its black button nose, is the main hallmark of the breed. Owners typically keep this fur clipped short in a “puppy cut” if the dog is mainly a companion, but if the dog competes in shows, its fur is groomed in a dramatic sweep to the floor, complete with a voluminous topknot. The charming, characteristic black nose of the Maltese sometimes pales when not exposed to enough sunlight, usually in winter or when sick. They become pink or light brown and should darken again in the summer. The temperament of this dog breed is sweet and loving. Bred to be a companion dog, the Maltese is the happiest when near its owner and family. They are fearless and assume everyone they meet is a new friend. Therefore, this dog should never be forced to sleep outside or kept at home alone for long periods of time. Since it is a small dog, the Maltese is prone to barking. Any family looking forward to bringing a Maltese into their home should recognize that this is a dog breed who will bark often, as the Maltese is often abandoned because their owners do not understand this fact. They will retain their playful, puppy-like nature for many years. The Maltese’s fur sheds little due to its lack of undercoat. Therefore, it requires daily brushing and regular grooming to prevent mats from forming as the coat doesn’t shed itself. This grooming should include care of ears, eyes, teeth, and nails. The Maltese’s light hair lends itself to staining around its eyes and mouth, and owners who dislike this staining can wash their dog’s mouth after meals and treats. The eyes can be cleaned daily with warm water. If staining continues or grows worse, consult your veterinarian, as this could be a sign of a more serious problem like infection. Take extra care when clipping your Maltese’s nails or grooming the fur on its paws; its paws are very sensitive and your dog may be skittish if not yet habituated to its grooming routine. The average Maltese lifespan is approximately twelve to fifteen years. Like many small dogs, the Maltese is prone to patellar luxation, reverse sneezing, and collapsed trachea. Due to this risk, traditional or choke collars should never be used on a Maltese and instead harnesses should be used to walk your Maltese. The Maltese may also have White Dog Shaker Syndrome, which you can discuss with your veterinarian how best to treat. Exercising a Maltese is a breeze, as they will often tire themselves out by being active inside and only require a few brisk walks per day as well as some playtime. Training a Maltese dog is a unique task. Due to its love for humans, the Maltese will try its best to learn obedience and tricks. However, it may prove slightly difficult to potty train your Maltese. They are relatively intelligent for companion dogs, but they are not as intelligent as working dogs. Maltese are prone to chills and sunburn, and should be monitored well when not inside. Many owners paper train their dogs so they do not have to use the restroom outside in the dead of summer and winter, which could be painful or dangerous for this small dog. Be sure to contact a reputable breeder or look for a Maltese rescue to bring your new dog into your home. A cute Maltese dog will become a treasured member of your family and together you will make many fun, happy memories!